H.E. Mr. Urbino Botelho, Minister for Foreign Affairs and Communities of the Republic of São Tomé and Príncipe visited New Delhi on 7 September 2018. FM Botelho met External Affairs Minister Smt. Sushma Swaraj and discussed matters of mutual interests. 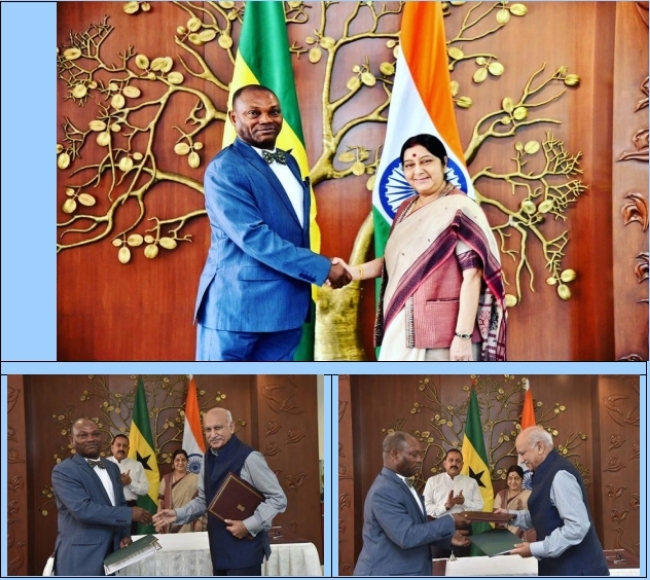 Later, the External Affairs Minister witnessed the Signing and Exchange of Agreements between India and Sao Tome & Principe. ( Photographs of the event are posted here) India has reiterated its continued support to Sao Tome and Principe through government to government development cooperation, business to business contacts, technical cooperation and capacity building to facilitate the rapid economic & social development of its people.